produce. 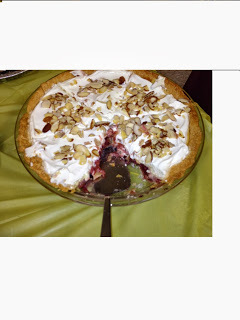 I used the last of the rhubarb in the following fantastic recipe. As tasty as the recipe is I do not recommend it for breakfast. together rhubarb, 1 cup sugar, cornstarch and salt. Cook over slow heat until rhubarb is tender. minutes, pour cream cheese mixture over the hot pie. Bake pie at 350 degrees for 35 minutes.